Full service grooming for your furry friend! 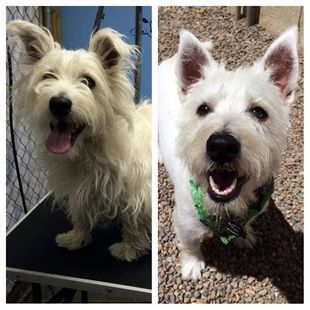 Grooming is offered during Daycare hours Tuesday, Wednesday and every other Friday. Dogs who receive grooming on a day they also attend daycare will only be charged $10.00 for daycare that day. Grooming is by appointment only (occasionally we have room for baths etc. the day of). Please call our office to book your dogs groom! We will have them looking and smelling like a million bucks! Contact us for more information on Grooming services. All Breed Grooming: Price determined by breed, size and condition coat is in. Baths: Start at $20.00 depending size and coat type. All Baths include: Nail trimming, ear cleaning, bath, blow dry, fragrance cologne. 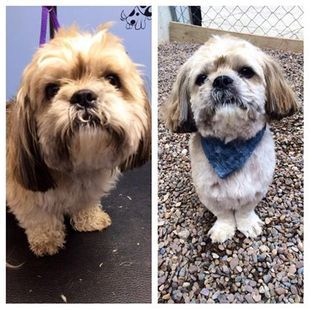 *Have a dog who doesn't like to be groomed or who other groomers have turned away? Our trainers often assist with difficult dogs and help making grooming a positive experience while still getting the job done. Give us a call to discuss your dogs grooming needs. Periodically we offer grooming specials. Please check back for upcoming specials.